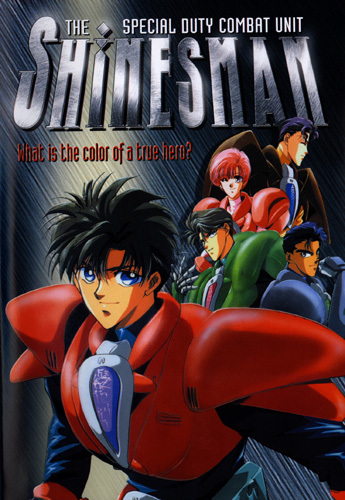 Last I checked, this anime was available on DVD at Amazon and The Right Stuf, and on VHS at Amazon. The above info came from R.G., and was edited by yours truly (contact me). The image came from Amazon. Aliens from the planet Voice decide to invade Earth through corporate raiding. Fortunately for our world, the Special Duty Combat Team Shinesman is there to stop them! The team is composed of dedicated employee Hiroya Matsumoto as Shinesman Red, ladies' man Ryoichi Hayami as Shinesman Moss Green, car crazy Shogo Yamadera as Shinesman Grey, doting father Shotaro Ono as Shinesman Sepia, and tough as nails office lady Riko Hidaka as Shinesman Salmon Pink. This two episode OVA is popular among anime fans due to its enjoyably funny English dub and its unique take on Power Ranger/Sentai style shows.